Some Mysteries are like 'Kyaka' from Songs of the Mist a Fabulous Book by Shashi Sharma : These Mysteries are not meant to be soved but cherished for a life time. 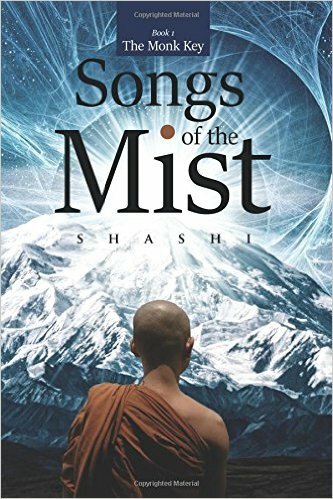 Hi Friends Let me tell you about a book I recently read.’Songs of the Mist’, the first book in The Monk Key series, is a spiritual/literary fiction writtenby Shashi Sharma. This is one of my rearest read , I am not much into books of this genre. Let me tell you people honestly I ‘was’ not into this genre before I read this book.So I guess you all can understand how inspiring this book is.As I was exploring this book ,some memories of childhood and late school life started flashing on my mind .When I was reading these lines“Death is not the destruction of your body or the flowing stream, but the merging of your dreams, desires, sorrow and anger into an eternal calm of eternity.” I was reminding me of Acharya Jagadish Chandra Bose’s literary work “Abyakta”. When I was studying in 9th standard we had a prose piece “Bhagirathir Utsho Shondhane”( Finding the source of Bhagirathi “ where the author simplifies the meaning of death and life-circle and draws a perfect anonymous example with bhagirathi’s source and course. The books starts first introducing all charecters including Ashutosh and proceeding to how these people are related to him.The book takes a new turn when an all-knowing but simple monkis introduced, there is Ashutosh got acquainted with the monk and their journey sails for many years and becomes a monk himself.Ayan is also an important character who seeks answers for his scientific problems but takes the path of spirituality to find those answers. Yogini Anishka is a unique character who takes up Yoga to heal her pain but ends up choosing spirituality as a way of life,she is a girl who had a past.Her past was surrounded by infatuation followed by a situation where she failed to differentiate between lust and love.Ends up identifying her interest as pure lust abd not love and decided to move on. There is Vasudha who had fame and every earthly pleasure needed in love ,Ashutosh’s llost love vasudha had some inner emptiness that was killing her.The other two important charecters are Kyaka and Calliope. One of the most unique thing about this book is it’s uniqueness that revolves around the scenic beauty of Himalayas .When Ashutosh meets the monk the journey next seems like a dream whose twists and turns are simple like the monk’s words but their meaning’s too deep to be understood in a single go. “Love is basically a very selfish emotion. It takes away your own control to be happy, within your own self, through your need for the other person to make you happy and selfish. It takes away the freedom to be happy or to even be sad.”The philosophy of this book is not only deep but also takes up awakening mode.Love here is no longer confined to the boundary of Male and female attraction.Here love is selfless love, love for family. One of the most attractive and mysterious character in this book is Kyaka.Her beauty and poise is simple and naturally charming like the scenic beauty of Himalaya. She is like a wild flower one cannot get over. Her enigmatic poise would make your mind picturise her. The authors unique way of describing Kyaka is praise worthy. Her mysterious presence will surely make many questions come back to back and I assure your mind will never get enough of it to answers those. My realization says Kyaka is not a existant human being but the imagination of the lead character Ashutosh.The Ashutosh that meets Kyaka or rather saying imagines her is mercilessly lonely and terribly upset.The Ashutosh that tells about Kyaka is all together a different person,he is a loner by choice.Lonely and terrible betrayed by destiny Ashutosh creates seeks a cool shade of affection as the scorching heat of betrayal , sorrow ,agony of loosing loved ones was killing him from inside.He creates a soothing andcomforting character in his mind and feels comforted by her presence everytime. I am not saying that this what is all about Kyaka , this is what I felt the author might me hinting . Kyaka’s is the epitome of mystery that is kind of addictive . This character’s decent appeal kind of forces readers to believe she exists on the other had series of mysterious do-gooded deeds makes a lot of questions come up.She again does something so alluring that you would believe in her existence.In the end her existence would felt like that soothing touch of mist that drifts away when the sun declares the dawn with a ray of hope.